It was a terrible winter for riding. The weather was the worst it has been since I first jumped on a motorcycle five years ago, with snow and ice storms one after another and periods of bitter cold in between. Once it began to get a little better, I went through about a month where I wasn't motivated and just didn't have the energy to ride. As the weather warmed, I was rusty, so it took a while to get back in the groove. Between writing my weekly column and other responsibilities, I was riding less than ever. But a strange thing happened recently. For years I'd thought that like many motorcyclists, I would switch to a touring bike as I got older and comfort became more important than pushing the envelope or styling. I was thinking more and more about that recently in part because I realized that I needed to slow down and my beloved R1200R roadster brought out the hooligan in me, compelling me to push the envelope in twisties and passes. 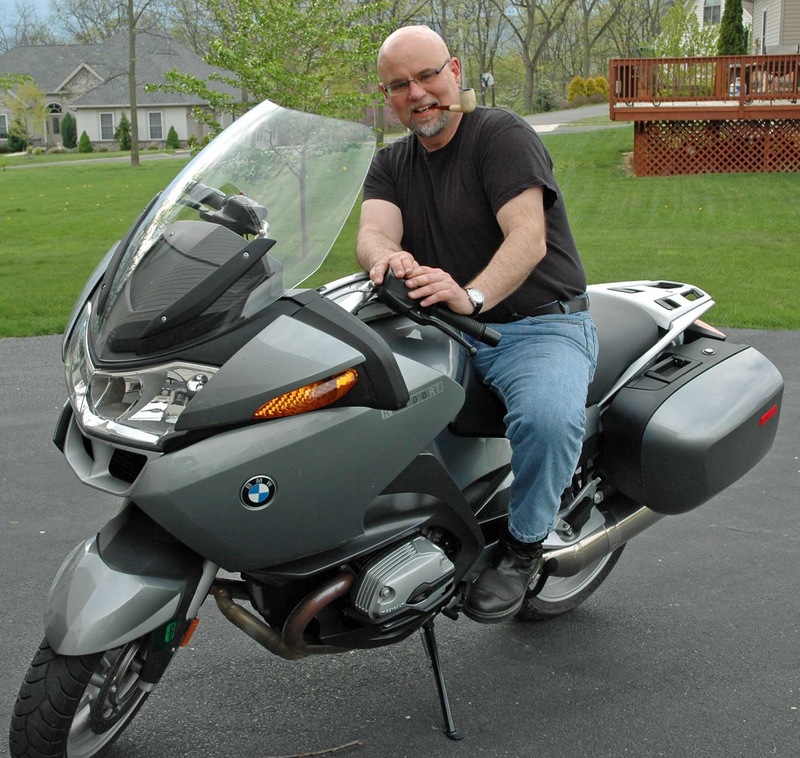 I assumed that after a few more years, I'd trade for one of BMW's "grand touring" six cylinder bikes. Then last week I had to drop my off at my dealer for some service. Since I hadn't been in for a while, I walked through the showroom to see what they had. I was struck by the 2014 R1200RTs. The RT is the touring or sport touring bike built on the same boxer engine/shaft drive as my roadster. 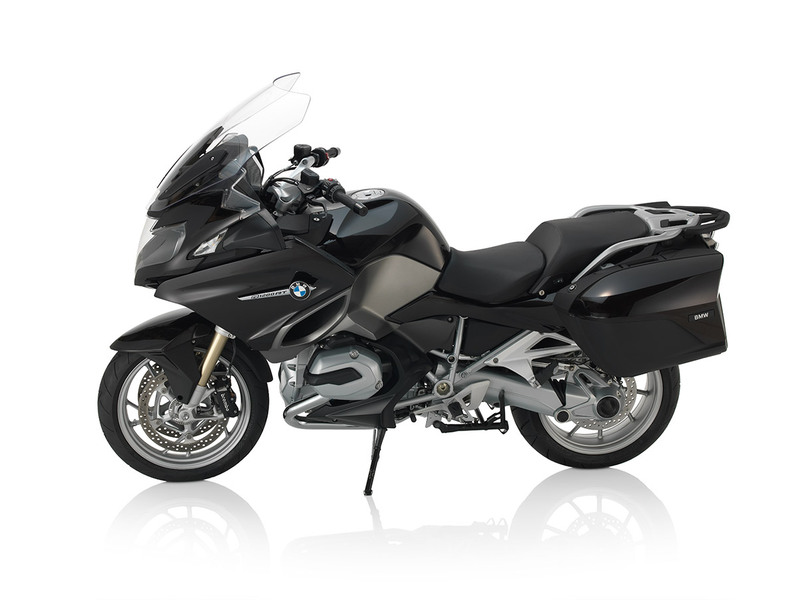 It's the middle sized of BMWs three touring bikes in terms of size and luxury. My dealer used to have a 2009 one as a service loaner, and I'd put a few hundred miles on it. I'd liked it but didn't love it, in part because the style just didn't move me and in part because I was still riding my small F800ST at the time and wasn't used to the size and power of the RT. It seemed ponderous to me. But the 2014 ones had a complete makeover. I really liked the new style. BMW also added a lot of neat electronic stuff and, after 90 years, had switched to a water cooled version of the boxer engine, pushing it up to 125 horsepower. As I was looking at them on the showroom floor, the sales manager said, "You ought to test ride one." I just laughed and said, "Yeah, some day I will." The next day the service department called and said they had to order parts for mine. This meant that I was going to be bikeless on a beautiful three day weekend. The only way I could to get at least a little fix was to test ride some motorcycles. So I scheduled a ride on the R1200RT and planned to do one on a Triumph Trophy which is equivalent to the RT. I even thought about riding a Victory. I put 18-20 miles on the RT including a few twisty little side roads and a short stint on the interstate. It was particularly impressive and eerie on the interstate to be buffeted all around by the wind then push the button to raise the windshield and all the sudden be sitting in complete calm and quiet. I thought about how great that, the cruise control and built in sound system would be for long hauls on the interstate. The models that my dealer had in stock included almost every available option--satellite radio, blue tooth, heated grips and seats, central locking system, electronic suspension adjustment, multiple ride modes, hill start assist, anti-theft alarm, tire pressure monitor. By the time I got back to the dealer I was impressed enough that I asked the sales manager to run some numbers on what it would take to buy it. But, honestly, I wasn't optimistic. Since I ride nearly ten times as much as an average motorcyclist and still had a year of payments on my old bike, I knew I didn't have much trade in value. I then went to the Triumph dealer. I'd read good reviews of the Trophy, particularly the three cylinder engine. But even though it cost less than the BMW, the quality of the materials clearly wasn't at the same level. And the salesman wouldn't let me ride it. So it was crossed off the list. Tuesday the BMW sales manager called me and, to my surprise, I could buy the RT without a huge increase in my payments. He called me the next day to go over the options on the bike and mentioned it had a low seat. That hadn't been on the dealer's web site so it was news to me. I drove down to see if I could live with it. I couldn't--I was much too cramped. The sales manager said he could order another one with the regular seat but I was worried that was going to screw up the whole deal since I'd put more mileage on mine while waiting, and that would further decrease the trade value. But then the owner came up, said he had a another RT that hadn't been uncrated, and he'd swap me for the regular seat. Deal done. So it's now early Saturday morning and I take delivery in four hours or so. I'm like a kid waiting for Santa. Today's weather forecast is 78 and sunny so I think it's going to be a most excellent day. I'm planning a six day, 2,000 mile ride week after next combining business and pleasure so I need to get 600 miles on the new one this week so I can have what BMW calls the "run in" service. Should be doable. More pictures to follow.